Use the lite almond split plate to install low voltage cables behind your HDTV, amplifier or other audio video devices. 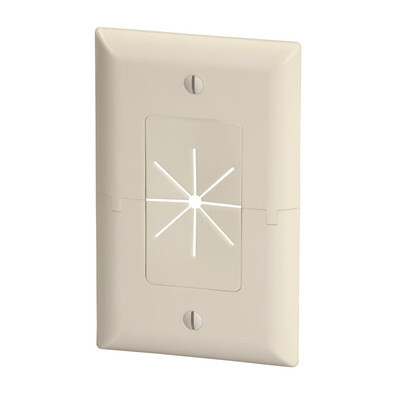 With the split design, this Cable Plate can be installed around existing low voltage cables run through the wall, eliminating the need to re-pull wires keeping the opening in the wall covered. The Flexible Split Plate holds up to 6 cables and mounts to our standard 1-gang low voltage mounting bracket (3031-11100).